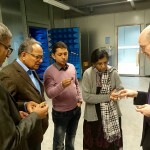 In February 2017, the India Platform organised a visit for its Indian partner NITTE University to various European stakeholders in Flanders and Portugal. In Flanders, the delegation visited Ghent University, Ghent University Hospital and the University of Antwerp. The delegation consisted of Prof. Dr. Ramananda Shetty (Vice-Chancellor of NITTE University), Prof. Dr. Indrani Karunasagar, Prof. Harsha N. Halahalli and Prof. Anirban Chakraborty. The focus of the visit was on exploring research and education cooperations in various domains. In the domain of health care, there were conversations with the Christian Mutuality in order to prepare the Health Care Ventures Visit to India in april. The organisation of the ‘International symposium on Universal Health Coverage’ at NITTE University was also discussed. 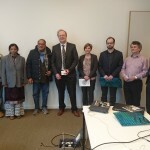 There were also meetings with the Chief Medical Officer and various doctors at the Ghent University Hospital, as well as visits to different faculties, such as bio-engineering, engineering, medicine and health sciences. A Memorandum of Understanding was signed between the Vice-Chancellor of NITTE University and the Rector of Ghent University. The delegation also visited the University of Antwerp, and discussed possible cooperation in education and research with its board. And in Portugal, the IP Stakeholder University of Aveiro organised the programme for the delegation. During this visit, the first formal steps were made to set up cooperations between India and Europe.